We are missing 4 bags that will hopefully arrive tomorrow….3 are team bags and one belongs to Kailey…so she will be borrowing a few clothes for tomorrow. Hopefully that works itself out soon! To family of our team members, we don’t have good internet tonight so there likely won’t be much contact but just know we are all doing well! Thanks for your prayers and support. We can’t wait to report back on our first day at Enaleni tomorrow! Paris in a day…with some adventures! Yay!! You’re there and we are praying for you all! I hope you all get or had a good nights sleep! Praying that your first day is an epic one! yay, your all safe, God is good. We are glad to hear that you made it safely! We’ve been praying and thinking about you guys. Looking forward to seeing pictures and hearing stories of your time in Swaziland! Glad to hear you all made it. Praying for you all for emotional, physical, and mental rest. Leigh your a rockstar! Cheering you on! Glad to hear you made it. We are praying you have an awesome impact on the kids tomorrow. So glad to hear that you all arrived safely. Hope you can all get a good rest . Prayers for all and love you Jo. By the time you are sitting around in the team room reading this comment you will have completed your first full day at Enaleni! You are full of emotions! You are a good tired and already beginning to process the new things the Lord is showing you! Today some of you began new relationships and others of you connected with old friends! Karen- I wish I could have seen your face as drove into Enaleni -and then as you walked around and saw all that the Lord has done!! Did you use your talking drum? LeeAnn– did you see Busi today? I think of you all throughout the day as I look at the clock and think what time it is in Swaziland and try to imagine what you are doing!! Praying for you and knowing what an amazing experience each of you will have!! Until the next blog– sleep well!! first of all, i did not realize REALLY how long of a trip it really is until i was on the WAITING side of things, it has been rather agonizing. Last year i was so excited and thrilled to be a part of it all and enjoying each part of the journey that it did not feel long. to all the returning team members of 2014, i love you. i feel deeply and irrevocably bonded to you all by last years experiences and i am cheering each one of you on. to all the NEWBS. i am so excited for you God has brought each one of you to this place at this time for a reason, and i would love to hear how this will impact each of you personally. I hope you enjoy every moment, that you give all of yourselves and that you are prepared to receive far far more than you give. Now to my favorite person in the whole entire universe, my Benny. I love you, i am so proud of you. I have thought so often how i wish i could be there with you, to watch you take it all in for the first time. For whatever reason it seemed better at this time to divide and conquer. But i do feel that i am with you, each step of the way as i relive what we did last year, and it helps me. I am so happy for you to take it all in as it was meant for you. Go and do what you do so so well, make them laugh, make them sing and dance and worship with all their might, and make them feel that they are the MOST special children in the world. You are so loved. You are all just a thought away!! Wow, this is all pretty exciting to see this new adventure of God unfolding! I can see that you have a fun-loving group who are all ready to encourage in generous ways. 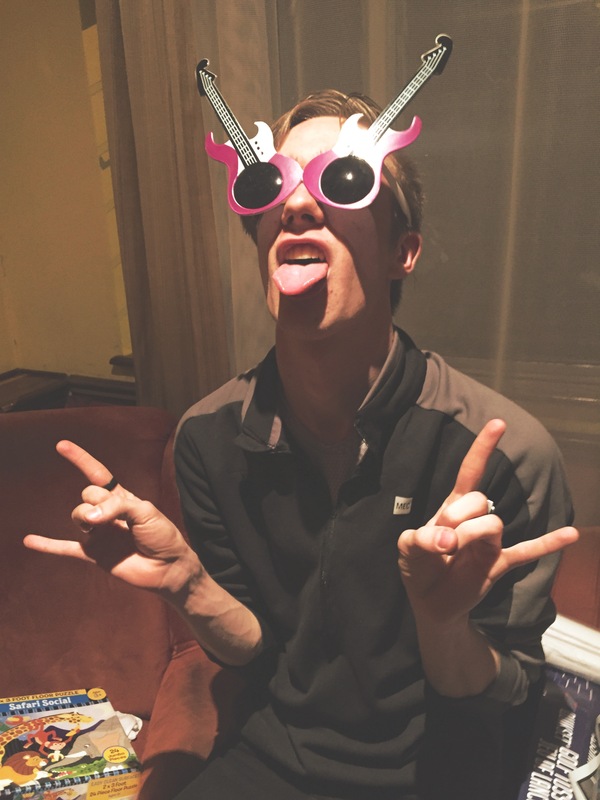 I especially like the practiced use of my guitar glasses … lookin’ good… I am sure the kids will have fun with that photo booth idea! Blessings to you all. We will keep you in our daily conversations with God. Leigh this comment is for you!!!!!!! So glad to hear that you made it safely with the team. You will definitely be missed and thought of this evening at small group! Praying you have an effing fantastic time 😉 and that God does immeasurably more than you can ask or imagine! It has been so exciting to see you prepare for your return to Swazi and your passion and care for that place is so evident. I can only imagine the joy you are experiencing upon your return! Praying that the 2nd time round will bring a new depth of relationship for you with the people of Swazi and opportunities to meet and form bonds with many new people there! Missing you Cheryl and praying you are feeling well. Say hi to Bryan (missing him too). I can’t wait to hear the “Paris” story and all about the times with the kids. Praying for you my friend. Hello Swazi-Canadians! What an incredible experience you are having. We are standing with you (at least those of us who have the energy to stand and our joints are strong enough for us to stand . . . thanks Jon 🙂 and so thankful for you. Press forward in love! Good to hear you all made it there in one piece and well rested, well restedish! I know that God has so much for you and know that he will be with you every step of this journey. I did first mission trip 23 years ago and I can honestly say it has shaped every part of my last 23 years. God will use every and I mean every part of this trip to point you towards Him and his continued call on your life.